My intent in “Clover and Corn” was to convey a sense of contrast between the enclosed space of the ground versus the open, brilliant sky. The dirt path, brilliantly lit, becomes a corridor between the tall corn on the right and the trees and undergrowth on the left, with no view beyond. This sense of restriction pushes the eye upward, into the airiness of the sky and hanging clouds. The turn of the path in the distance provokes the viewer to wonder if the constrictive corridor will continue, or if the landscape will open to longer views, giving the viewer a chance to impose his or her own story upon the scene. 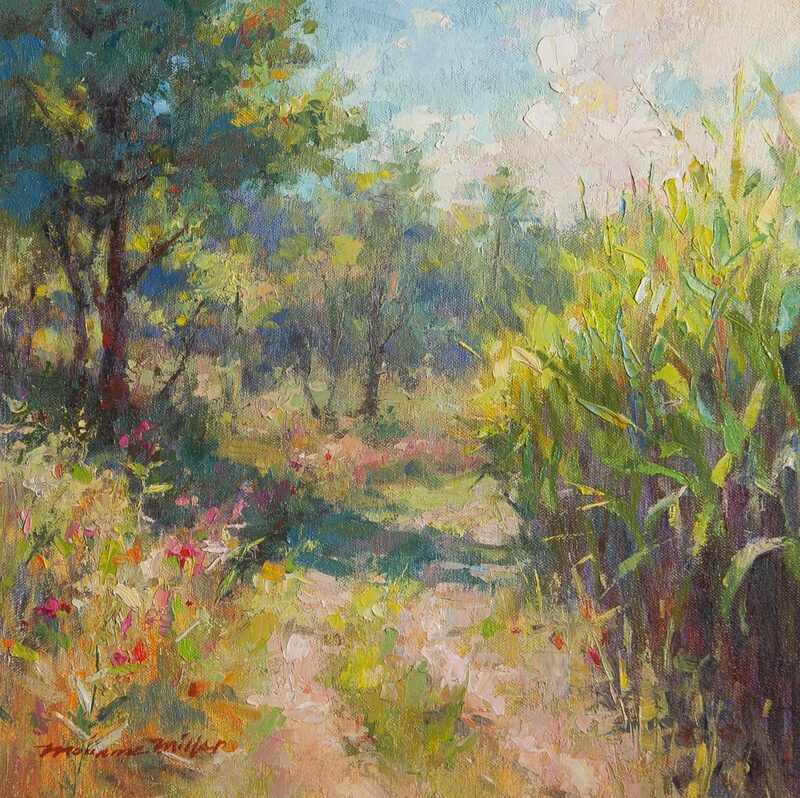 Marianne Miller, a Columbus painter, luminously depicts rural landscapes and scenes of everyday life at popular locales around Ohio.Â Miller prefers to work en plein air, i.e. in the open air, depicting scenes directly as she sees them.Â She is constantly searching for new and unique views of nature that might otherwise be overlooked. The alluring colors and soft brush strokes invited the viewer into the relaxed and intimate atmosphere of her work, whether it is an image of an Ohio farmhouse, the countryside, or an elegant still-life.Â A graduate of the Columbus College of Art and Design, Marianne originally majored in illustration and worked in the illustration field for 10 years before taking a break from art to start a family. 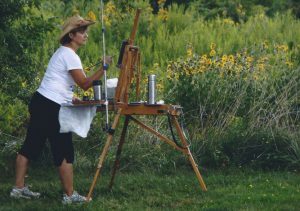 Later, after experimenting with a variety of forms of art, she finally found her niche in the field of oil painting and was particularly attracted to the plein air technique.Â In the five years since, she has won a number of awards from the Ohio Plein Air Society and has completed an Artist Residency at the Glen Arbor Art Association in Michigan.